Team conflict is normal. Avoiding team conflict is also normal. We see that tendency when we work with teams and, let’s be honest: we often see it in ourselves. We would rather avoid than engage, even when we know that it can ultimately be a valuable contribution to team performance. The simple truth is unattended team conflict, over time, cripples the team’s ability to effectively collaborate. All sorts of bad behavior results, much of it subtle, passive-aggressive, and for some teams a pervasively toxic work environment. Our TCI Team Effectiveness model describes team competence in 14 separate areas. One of those 14 we call Constructive Interaction. This competence includes the ability to manage team conflict well. It also includes the team’s ability to interact in constructive ways around feedback and the ability of team members to hold each other accountable in a constructive, rather than nagging or criticizing way. Constructive Interaction is the lowest scoring factor for all teams. 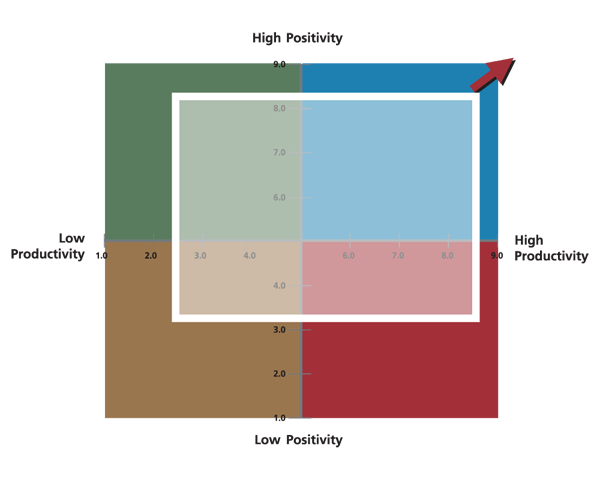 High Productivity/High Positivity teams score higher than average teams and much higher than Low/Low teams, but that factor still scores the lowest of the 14 even on high performing teams. The data validates our experience but it also points to this important observation: leverage in this one key area can make an enormous difference in team performance and team culture. The important question is not how to set up team conditions to avoid or quash or sanitize team conflict. The question is how to effectively manage the power and inherent energy, the passion, commitment, and courage that is possible in conflict. The truth is, if your destination is “high performing team”, you can’t get there from here without encountering a rough ride from time to time. Unfortunately, too many teams are so conflict-averse, they waste time and energy trying to navigate around it, or ignore it, or simply try to postpone it. Tactics like that are understandable on one level. We’ve all experienced the downside of conflict. Entering the storm feels risky; things could get out of control. We all have memories, scars, and bruises from situations where the experience of conflict was destructive. We may know, intellectually, that serious debate, differences of opinion, even argument, are all normal in groups and teams. The fear is, the disagreement will escalate, become personal, there will be confrontation, everything will get derailed and the net result will be irreparable damage to the team’s ability to work together in the future. That fear of loss takes many forms: loss of respect or prestige, loss of rank or connection; at a deep level, fear I will be cast out of the tribe. It’s also true that we all handle conflict differently. Some people are naturally more inclined to engage with conflict and for others negotiating, or avoiding, or peacemaking are more natural. Some team coaches use a kind of "conflict styles" inventory with team members to help identify those natural tendencies. That information can be enormously helpful for team members as they gain insight into their own conflict style and learn the differences on the team. Just that level of insight and understanding can help normalize team conflict and make it easier for team members to engage from a place of awareness. The fact is, competency with resolving conflict is not a natural ability and for most teams, there has been little if any training. Most teams and team members are simply not well equipped to work with team conflict. They get triggered by emotional hooks and lose their ability to engage constructively. Those same triggers and default responses happen over and over, perpetuating the conditions for conflict and moving further away from conflict resolution. So people hold back to keep the peace; they maneuver around hot issues; the floor is covered with eggshells. When that happens, teams pay the price of “peace at any price”. They miss the value that is possible from getting messy. Conflict arises when the people involved care about the outcome. We want teams where team members care. Indifference is death. And by the way, everything we just said about why teams hold back from conflict applies to the coaches too. Conflict is inherently messy, fiery, emotion-packed, and unpredictable. As team coaches, it is an important aspect of team life and our value depends on our own ability to work in that environment. There is great energy present in conflict. The key is finding the way to unleash that energy in a constructive way that supports the team and individual team members, thus turning it into a constructive conflict. So – how can we “turn conflict into trust, resilience, and results"? We start by normalizing conflict as a natural, even necessary condition for an effective team, and then train teams in conflict engagement. There are fundamentally two types of conflict. Functional Conflict: Disagreement involving tasks, issues, ideas, principles or process. Relationship Conflict: Conflict about people, values, arguing over who’s right, focused on winning; sometimes referred to as dysfunctional conflict. It focuses on the players and can quickly escalate into attacks, blaming, incendiary comments—exactly what teams fear most about conflict. With functional conflict, it is clear that a challenging conversation is for the benefit of the team. With relationship conflict, it is for personal interests and often focused on non-team issues. The atmosphere of the conversation is a clear indicator for which of those two is in play. In both cases, there can be very strong passion, heat, and conviction but with functional conflict, it feels more open; there is more room at the table and a sense that the struggle has a team outcome. The team is headed somewhere even if the ride is bumpy. By the way, that doesn’t mean it will be pleasant. It is conflict after all and likely to be uncomfortable at the very least. With relationship conflict it is exclusive, not inclusive; it feels closed, tight, confrontational; it feels volatile and potentially destructive. It doesn’t feel like we’re headed anywhere useful, at least not together. This distinction alone gives teams the ability to notice and self-correct when the conflict begins to shift from functional to relationship-based conflict. The “heat of the moment” can also be an appropriate time for the team coach to refer to the team’s “Rules of Engagement” or “Safety Agreements”. The team may already have a more generalized list of team agreements; this subset of team agreements is specifically created for those times when there is conflict present. That context is important as a starting place for teams to be specific about their interactions in those conversations. We give each other time to reflect when they ask for it. We don’t tolerate blaming, stonewalling and personal attacks. We consciously look for areas of alignment in the midst of disagreement. We speak in “I” statements. Start early. Before it became a fire, it was an ember. It may have been a minor irritation that was the result of a simple misunderstanding or differing expectations or assumptions. The irritation can be a signal to check for the underlying cause. If the irritation persists it often becomes an inflammation and a festering complaint. The antidote for a complaint is often a request. What is the request that would address this situation? If team members allow the early signals to persist, they build momentum, very naturally. Of course, not all conflict on teams follows a gradual heating cycle. Be willing. Take the initiative. Be committed. Then stay, even when it is uncomfortable. This may be the most important of the six steps. For team members, taking initiative is a visible signal to a team member or the team that the agreement to engage, constructively, is being honored. Look for areas of alignment. Consider the dissenting or contrary view (or views if there are more in the discussion). Even if only the tiniest fraction were true or useful, what would that be? What do we both (or all) care about? Find common ground even if there’s barely enough room for both of you to stand. Then take a stand for that. Listen for different points of view. Stand in the other’s shoes—maybe not literally, but team members might change seats at the table and try speaking on behalf of that other point of view. What is there to learn from there? Practice empathy. Listen for understanding. Practice active listening. Summarize what has been said. This will naturally slow down the pace of exchange and has a tendency to take some of the heat or charge of the communication. It also builds empathy. Search for solutions or actions. Be generous and inclusive. Explore for ideas outside the usual or familiar. This will help expand the universe of possibilities. Aim to listen as much as they speak. Ask questions as often as they state their position. Ask open-ended curious questions and ask for clarity. Acknowledge and appreciate one another from time to time along the way. In the midst of team conflict it may not always be apparent, but long-term, successful, respectful conflict builds trust and resiliency because team members have “been there before” and have built both muscle for the process and successful outcomes. Teams that learn to engage in difficult conversations are more apt to put the challenging ideas and opinions on the table for consideration and thereby accelerate problem-solving and make better decisions. A willingness to hear and contribute dissenting, even unpopular views leads to better understanding of others and a deeper appreciation for diversity. Teams that take risks in important conversation are more proactive and ultimately create an environment that is more creative and innovative. We believe that the hallmark of exceptional teams is that they have learned how to extract the energy in team conflict without having the bomb go off. The ability to take full advantage of the interaction that occurs in challenging conversations or discussions in a way that is constructive for the team is an essential team competence. Teams that learn how to stand in the fire are made stronger, having been tempered.